Tom Waghorn was taught by respected luthier Phil Davidson and has been hand-making acoustic guitars in the Bristol area since 1996. "I use European spruce as standard for the soundboard which I prefer for it's warm resonant qualities, which is then thicknessed thinner than most modern acoustics and graduated even thinner around the edges, combined with scalloped or voiced bracing to achieve an extremely lively, rounded sound. 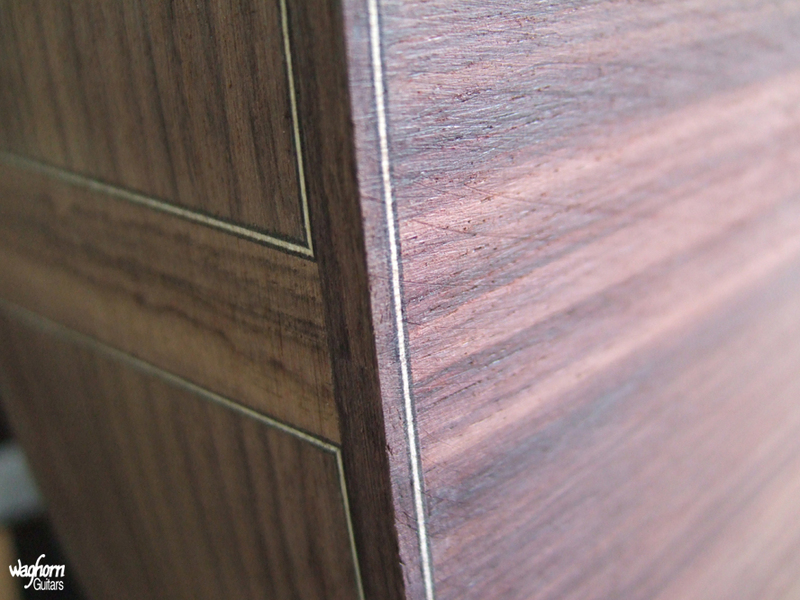 "Back and side wood options are open to discussion but readily available timbers such as Indian rosewood, American black walnut and mahogany are popular choices, including reclaimed mahogany. 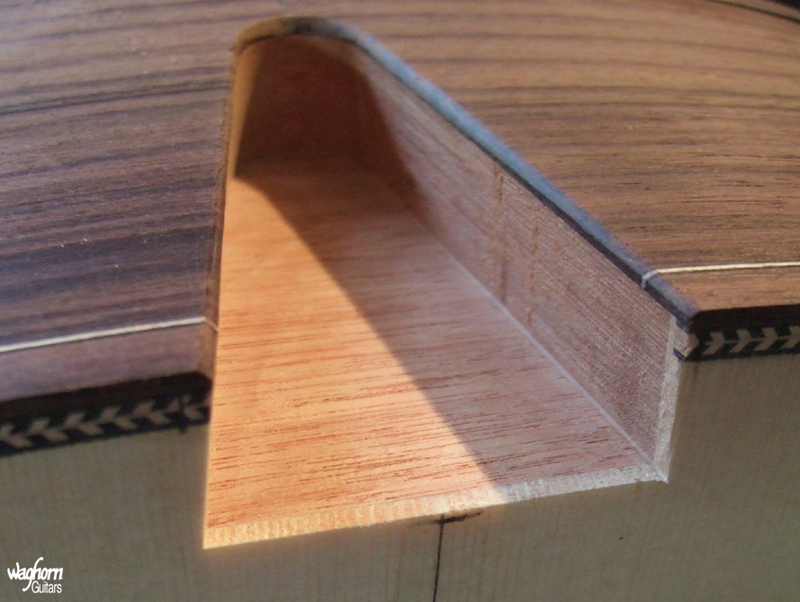 "Necks are made from quarter-sawn pieces of timber - continuous lengthways from the dovetail all the way to the headstock end for strength, but of two, three or sometimes five laminates across the width of the neck with opposing grain direction to provide strength against warping or twisting. The result is an extremely strong neck that will stay straight and allow a low action should you want it. Nuts, saddles and bridge pins are made from bone as standard, and you can choose the binding, bridge, fingerboard and headstock facing woods to compliment your chosen aesthetic. "Perhaps you have a sound or particular playing style in mind - arrange an appointment to have a chat with me and we can discuss your ideas and requirements to make your custom Waghorn acoustic meet your needs perfectly." Choose from body designs which include styles such as our popular Hydra, OM, Dreadnought, Mini Jumbo, Parlour, Classical and many others. 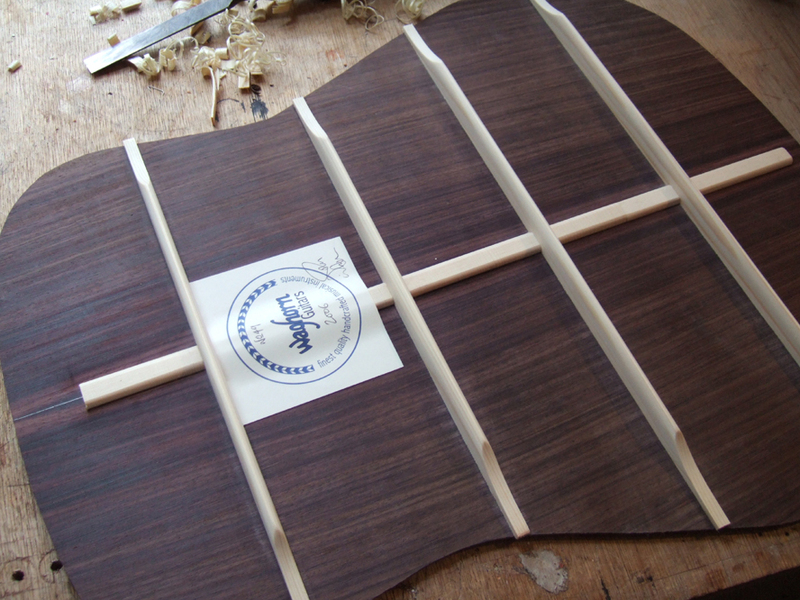 We also have several acoustic headstock designs to choose from in styles both traditional and modern, as well as classical guitar slotted headstocks. We can build you practically any style of acoustic guitar, be it steel or nylon strung 6 string, 12 string, 7 string, acoustic bass or even a multi-scale instrument. 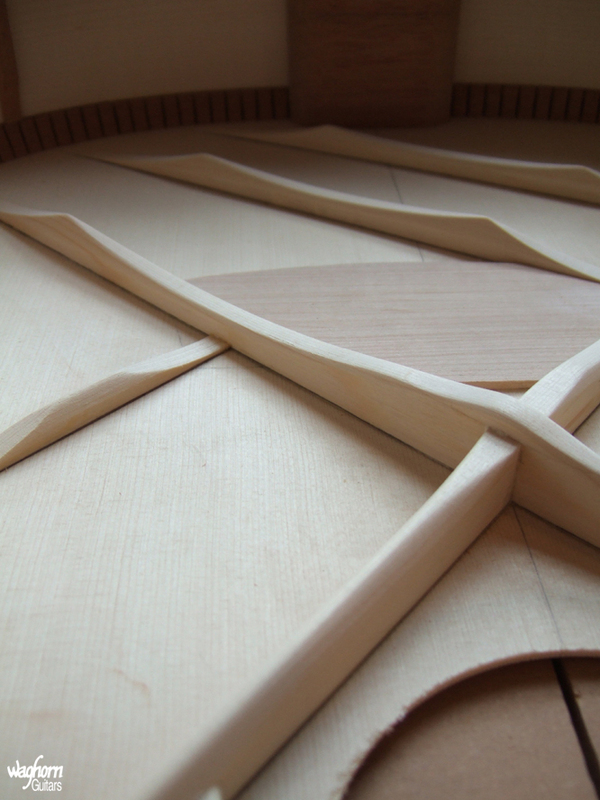 You can determine the neck width and profile, the level and style of decoration such as soundhole and fingerboard inlays and purfling, body binding and detailing. Options such as cutaways and arm chamfers are also available. See our Acoustic Gallery for examples of previous custom work. All acoustic guitars whether steel or nylon strung are available with the option of a pickup. I find the Headway HE4 active under-saddle pickup works particularly well in my guitars as it sounds transparent and is unobtrusive in design. Pickup systems from other manufacturers such as Fishman and L.R. Baggs are also popular. Call to discuss your options. We offer two main clear coat finish options; Gloss and Satin. Both are essentially the same finish, but the Gloss will typically receive more coats and undergo more sanding before polishing to a high mirror gloss. Our necks are finished in Satin as standard for a super fast feel, but Gloss is an option if you wish. Take a look at our acoustic guitar gallery to see previous examples of gloss and satin finishes as well as various examples of tinted and sunburst finishes that we have produced in the past. Waghorn acoustic guitars start from £2000.00 for most steel string and classical guitars, and £2100 for 12 string or acoustic bass. 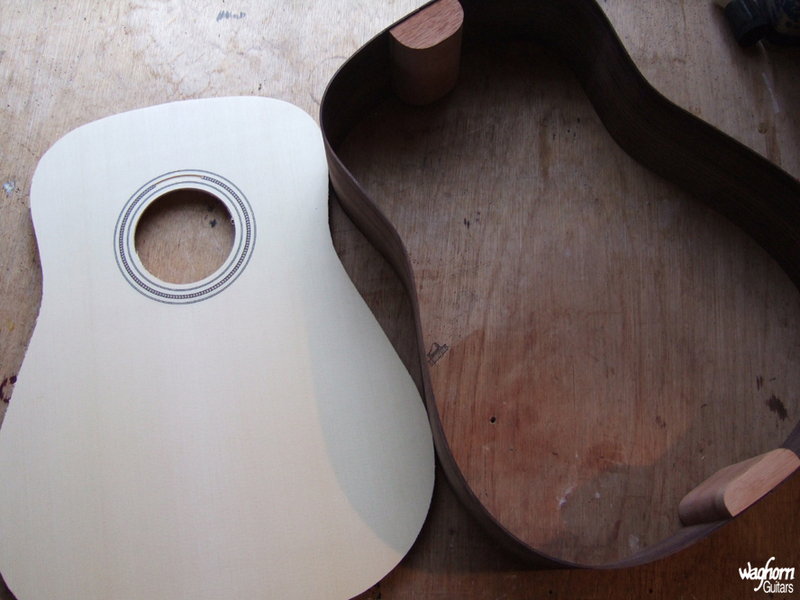 For a detailed custom acoustic guitar quote see our Acoustic Custom Quote Form or call 0117 927 2111. All Waghorn instruments come with a lifetime guarantee against faulty workmanship and materials. To protect your Waghorn acoustic, we recommend Hiscox Cases. They are strong, durable, thermally insulated, made in the UK and amazing value. Hiscox cases come in a variety of sizes and three different acoustic guitar ranges and are available as an extra for the majority of our acoustic guitars.